Incredibly, this immature Brown Booby (photographed onboard a ship on the northern Grand Banks) represented the second record of this primarily tropical seabird for Newfoundland. Origins: A pantropical species, occurring in the tropical regions of the Atlantic and Pacific Oceans, including the Caribbean and Gulf of Mexico. It is occasionally seen further north, and increasingly so in the past few years with recent records in New England and New Brunswick. Record Details: Four records for Newfoundland. (1) The first was an individual that was photographed near St. Anthony on July 18, 2012 as it took refuge on a tour boat. The photos appear in a local newspaper article here. It was reportedly seen dead on rocks at the harbour entrance the following day. 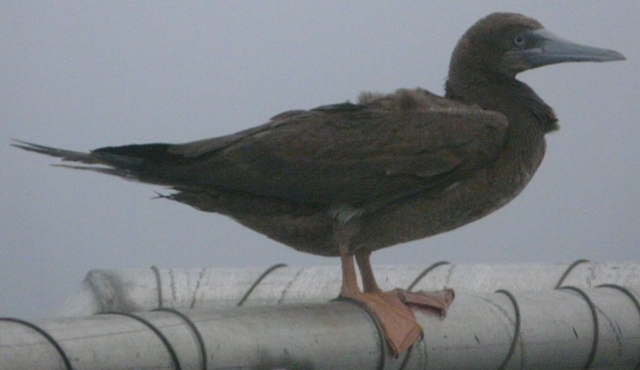 (2) The second was an immature bird photographed resting on a vessel on the northern Grand Banks on September 4, 2013. (3) Thirdly, an adult was seen and photographed sitting on a rock jetty at Long Beach (near Cape Race) on August 4, 2015. Unfortunately, it could not be relocated later that day or the following. (4) Most recently, an adult was reported and photographed on a cruise ship on August 24, 2017 – at that time just a few miles outside the Witless Bay Ecological Reserve. Interestingly, video later surfaced of an adult Brown Booby onboard a shrimp boat near Square Island, Labrador on August 15, 2017 — potentially the same bird? This is the only record for Labrador. An immature bird was also photographed on a Coast Guard vessel ~220nmi offshore (outside official waters) on September 1, 2014.